The Department of Babasaheb Ambedkar Marathwada University shall display the Ph.D Entrance Exam results very shortly through the university website. Admission Department of BAMU University will declare the results along with merit list / cutoff list of candidates within in 30 days from the examination. Appeared candidates may check and download the results by the use of Hall Ticket Number / Admit Card. The Aspirants, who will qualify the BAMU Ph.D Entrance Test, will be able to appear in the counseling rounds, and after the counseling the candidate, who will match cutoff marks, shall be selected for admission to Ph.D programme in various subject (Arts, Commerce & Management Science, Education, Fine Arts, Law, Physical Education, Science, Social Science / Social Sciences, Engineering & Technology). 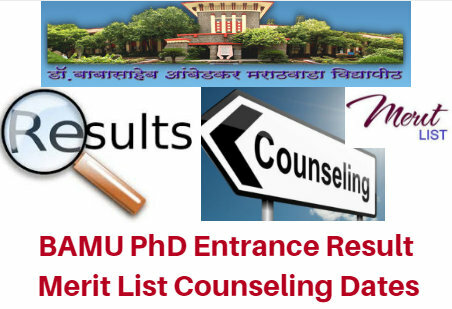 Candidates must take the BAMU Ph.D Admit card/Rank card, SSC memo, Intermediate memo, caste certificate income certificate etc at the time of Counseling. The Counseling procedure and schedule will be updated soon on the official website. Minimum Age Limit shall be 21 Years on or before. Normally there will be no Upper Age Limit. Five Years’ of Professional / Administrative Experience Services. Those working with the Recognized Colleges / Universities are also exempted from PET 2018. General / Un-Reserved: 45% Percentile Marks in Aggregate. Reserved: 35% Percentile Marks in Aggregate. Assessment of the Candidate’s Subject Expertise, Research Aptitude and Subject Knowledge. The Body that considers the Research Proposals for a Research Degree of the University shall be called the Research Degree Committee. The RDC consist of Seven Members, viz., the Vice Chancellors (Chairperson), Convener, two Internal Members and three External Experts nominated by the Vice Chancellor. Any Candidate registered for Award of the Degree in Doctorate of Philosophy (Ph.D.) shall be allowed to submit his / her Thesis not before Two Years from the Date of Approval of the Research Proposal by the Research Degree Committee. The Candidate, at the time of Submission of the Thesis, will have to deliver a Seminar in the Department / Research Scholars and Post Graduate Students. The Supervisor concerned will submit a Certificate with the Panel of Experts / Examiners that the Scholar has satisfactorily delivered the Seminar satisfactory. Moreover the Candidate must have put in an Attendance of 360 Days at the Venue / Place of Research. A Certificate to this effect from the Supervisor must accompany the Thesis. The Maximum Period allowed for submission of the Thesis is Five Years from the Date of Approval of the Topic by the Research Degree Committee. However, in some genuine cases the Vice Chancellor may allow an Extension of Two Years but that too with the recommendation of the Supervisor and the Candidate has to pay the Fee determined by the University from time to time. In case the Candidate fails to submit the Thesis in the stipulated Time of Five Years then his / her Registration Automatically stands cancelled. The Examiners shall separately examine the Thesis and submit their Detailed Reports and the Final Recommendations, if all Three Examiners recommend Award of the Degree or Two Examiners recommend award of the Degree and Third recommends the Revision and Re-submission of Thesis, the Candidate shall be called upon to appear for a Viva-voce. There shall be an open Viva-voce, which shall be conducted at respective Department or approved Research Center concerned under the Overall Supervision of the Head of the Department, the Viva-voce may be conducted at the University on the request of the Candidate with the Prior Approval of the Vice Chancellor. The Candidate shall present a Summary of his / her Thesis and the Work done by him / her before an Audience consisting of Two Viva-voce Examiners appointed by the Vice Chancellor the Candidate shall present a Summary of his / her Thesis and the Work done by him before an Audience consisting of Two Viva-voce Examiners appointed by the Vice Chancellor, Teacher and Post-Graduate Students of the Subject concerned and Allied Subjects. A Notice to this effect shall be circulated by the Supervisor with the Prior Approval of the Head of the Department / Principal of the College concerned / Head of the Institution. A copy of the above Notice shall be attached with the Viva-voce Report. Any Candidate fulfilling one of the following requirements may be considered for Admission into Doctorate of Philosophy (Ph.D.) Program without appearing in the Ph.D. Research Entrance Test (RET). However, they will have to appear for the Interview and obtain the Minimum Qualifying Marks (to be specified) in the Interview. Any Candidate, who has qualified the National Eligibility Test (NET) as National Eligibility Test Junior Research Fellowship (NET- JRF), However, the Candidates qualifying the National Eligibility Test for Lectureship (NET-LS) (National Eligibility Test for Lectureship), or the State Level Eligibility Test (SLET), only, shall not be Eligible for Ph.D. RET Exemption. A Permanent Teacher of the Institute with Post Graduate Qualification and at least two published Papers in a Standard Journal or two Full Papers on the reputed Conference Proceedings. Master of Philosophy (M.Phil.) Students of Babasaheb Ambedkar Marathwada University, who have qualified the RET of Babasaheb Ambedkar Marathwada University for Admission into Master of Philosophy (M.Phil. ), are exempted from appearing in the RET for Doctorate in Philosophy Admission in Babasaheb Ambedkar Marathwada University. Graduate Aptitude Test for Engineering (GATE) will be considered for Admission into the Discipline under the Faculty of Engineering only. Any Candidate, who is a Recipient of Fellowships of the Government / Semi-Government Organizations, such as, the Council of Scientific and Industrial Research (CSIR), University Grants Commission (UGC), All India Council for Technical Education (AICTE), Department of Science and Technology (DST), Defence Research and Development Organization (DRDO), Department of Atomic Energy (DAE), Department of Biotechnology (DBT), and similar National-Level Organizations, which are awarded through an All India Selection Procedure conducted by the Agency / Organization concerned. However, the Candidates selected in the Research Project funded by such Organizations shall not be considered under Ph.D. RET Exempted Category. Mode Of Application Online Application Form. Press Click here on BAMU Website / BAMU Website for Detailed Notification.